Triumph motorcycles achieved a reputation for beauty, speed and service that was the envy of all other marques of the period. Triumph’s early success with the 500 cc Speed Twin in 1937 initiated their status as the premier manufacturer of this type of engine, and the 650 cc T120 Bonneville cemented it. While Triumph also made the 200 cc T20 Tiger Cub single and Trident 750 cc T150 triple, both selling well, it will always be the vertical twin with which the Triumph name is associated in vintage motorcycling. By far the most successful of the old British motorcycle makers, given their limited model range, Triumphs were often the fastest machines on the road, usually ‘breathed on’ by American tuners. Business was splendid until the Japanese arrived in the sixties and rewrote the book on reliability, horsepower and ease-of-use. It took the British motorcycle industry nearly a decade to respond and by the time they did, it was too little, too late. 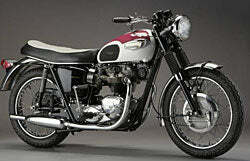 The 750 cc T140 Bonneville and T150 / T160 Trident machines of the 70s were fast becoming anachronisms. An era was coming to an end. Triumph of Meriden ceased production in 1983. A new Triumph company started production in 1990, and is currently doing quite well, but their models owe very little mechanically to the Triumphs of old.